The US Navy has announced that their newest Auxiliary General Oceanographic Research (AGOR) class of vessels will be named after naval aviator and astronaut Neil Armstrong who passed away last month. 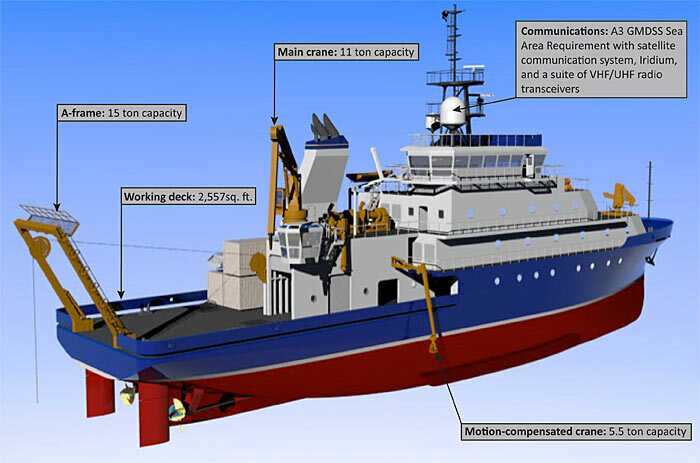 The class will be composed of two vessels and construction on the lead ship, R/V Neil Armstrong, began in August. Neil Armstrong is set to enter service in summer 2015. The Neil Armstrong class of vessels will displace 3,200 tons, stretch 238 feet in length and have a cruising range of 11,500 nautical miles at 12 knots. Neil Armstrong’s 1,800 square feet of dry, wet and computer labs will give its 24 embarked scientists plenty of space to conduct research and exploration operations throughout the globe. In addition to its lab and staging spaces, the Neil Armstrong will be able to launch and recover various ROVs and mini-submersibles with its stern and main cranes. Among the innovations included in the ship’s design is a hull optimized to divert bubbles from the sonar area for enhanced sonar performance. The ships are funded by the Office of Naval Research, but will be operated by non-profit oceanographic institutes. The yet unnamed second vessel of the class (AGOR 28) will be operated by the Scripps Institution of Oceanography in San Diego, California. Neil Armstrong will be based at the Woods Hole Institute of Robert Ballard fame and conduct most of her operations in the Atlantic.